Up early to wrestle the turkey into the oven, and thought maybe a few of you might be doing the same! Traditionally on Thanksgiving, we look forward to gathering with family and friends, and we celebrate those things for which we are thankful. So this year, I have added some new reasons to be thankful, and, not surprisingly, they include recent opportunities for collaboration in my professional life. A little over a year ago, I was invited to have an adventure with three other library educators in launching a collaborative blog about collaboration. The brainchild of Judi Moreillon, our mission was to share research, best practices, co-teaching ideas, and our own experiences about the many facets of collaboration in today’s schools. Social media was our vehicle to reach pre-service and practicing teacher librarians everywhere to generate discussion and comment. Along with Melissa Johnston and Sue Kimmel, we met virtually through a Google Hangout and through emails to organize a framework to publish our ideas on a rotating basis. As far as Judi could determine, there was no other blog quite like this one, so it was an experiment. We are still going strong, and are learning as we go- with continual tweaking and reflection about improving content and delivery. I have thoroughly enjoyed the experience and have appreciated a venue to share my voice on the art and science of collaboration and education that really resonate with me. In my posts earlier this fall, I shared the story about collaborative efforts for advocacy by the Vermont School Library Association. When faced with a situation that required collective action to effect change, our membership rallied to advocate for retaining language about school library staffing and programs in Vermont State Standards for education. Currently, as the process is still unfolding, we have been successful in that effort, and expect that the end result will be increased visibility of the role of teacher librarians and commitment to school library programs in educational communities around the state. I am so thankful for the close collaboration and relationships that have been forged in our work together. Thank you Denise Wenz, President of VSLA, Heidi Huestis, Chair-Professional Concerns, Marty Reid, Vermont State Librarian, and Jill Remick, Project Director for Education Quality Standards, and many others, too numerous to mention for all your hard work. In spite of the challenges, it’s a wonderful time to be involved in education and teaching. I’m thankful for the energy and inspiration that comes from working and collaborating with my friends in the field. Kudos to you all for making a difference- today and tomorrow. Happy Thanksgiving. Recently I was reading one of the many blogs I read on a weekly basis and I saw this post on Edudemic (which is btw one of my favorites) reporting results from a study on how teachers love educational technology, but they still aren’t using it. This is one of the premises of my own research – that the school librarian is just the person to help out with this problem, so I was immediately interested. You can see the entire post here. This quote from an elementary school teacher really resonated with me: “Teachers have so much stuff to do in a limited amount of time. If there was a resource available that would do some of the research leg-work that would be wonderful.” There is also additional data how teachers just do not have the time to look for and evaluate resources. Well you do have a resource available to you (unless they have been eliminated, which is a whole other issue) to do the research leg-work – it is your school librarian! I again see this as a great opportunity for school librarians to step up as technology leaders in their schools to address the needs of teachers. It is part of the job of the school librarian to stay current on new technologies and how to use them effectively in teaching and learning. During the past two weeks I have attended the Virginia Association of School Librarians Conference and the AASL Bi-Annual Meeting in Hartford. In Hartford, I attended a pre-conference led by Audrey Church, Jody Howard, Judy Bivens, and Mona Kirby on Performance Evaluations for School Librarians. In this session we learned about the wide variety of performance evaluations in effect in the fifty states plus the District of Columbia. Audrey Church shared information about Virginia’s system where school librarians are evaluated on the same instrument as teachers. This instrument includes seven measures: professional knowledge, instructional planning, instructional delivery, assessment of and for student learning, learning environment, professionalism, and student academic progress (VDOE, 2012). The seventh one: student academic progress states that “the work of the teacher results in acceptable, measurable, and appropriate student academic progress” and requires teachers to demonstrate their impact on student achievement. Many teachers (including school librarians), who don’t have test data connected to them, must explore other ways to demonstrate this impact. School districts have taken different approaches to school librarians. Some must have a program goal and measure, and others are required to have a student learning goal and measure. In the latter case, a pre and post-test are often administered to demonstrate growth for example, in information literacy skills. In this session, a comment by Nancy Everhart caught my attention. Nancy talked about identifying and measuring other impacts of a school librarian or school library program such as drop out rates or student behavior referrals. Quite often school improvement plans have achievement goals that are based on growth measured by end of course or end of grade test scores. But these plans may also include other school (and district) goals. These could include graduation rates, behavioral referrals and suspensions, and parental involvement. As school librarians, perhaps it is time that we work to demonstrate our impact on these valued measures. We know from research that parental involvement has an impact on student achievement (NEA). School librarians should be able to develop goals, implement programs, and develop measures to evaluate this important goal. We draw parents in as volunteers, for events such as bookfairs and family reading nights, and can measure parental visits to the library and circulations. I also believe school librarians have an impact on another area :teacher job satisfaction and teacher retention. Between 40 and 50% of teachers leave the profession within the first 5 years (Riggs, 2013). How can school librarians work to alleviate this problem? We can reach out to new teachers with offers to collaborate on lessons and units – not just lessons that will be taught in the library but to help them plan their own classroom lessons. We can be pro-active in identifying and providing materials for those lessons. And we can offer our assistance as the “information” person in the building. “Ask me anything and if I don’t know the answer I’ll try to help you find out who to ask or where to look.” These new teachers will become strong library allies. New teachers will remember that the librarian was a true lifeline in their early years and will remain instructional partners throughout their careers. A MetLife Survey (2010) found that teachers in highly collaborative schools were more satisfied with teaching as a career. Do school librarians who serve as collaborative, instructional partners have an impact on teacher retention? What about strongly-resourced library collections? How could we demonstrate these impacts? School librarians work with everyone in the building and therefore, should be able to demonstrate on various measures of school success. This is a special invitation to join us for a preconference workshop at the AASL National Convention next week in Hartford. Along with a team of school librarians and classroom teachers at each instructional level, I will be copresenting: Instructional Partnerships that Deliver Success: Meeting the Leadership Challenge. For a sneak peak, you can access our presentation wiki. Our ½ -day workshop will be held on Thursday, November 14th from 8:30 to noon. As you can see from the agenda, we will share information and engage in conversations about how school librarians can enact successful instructional partnerships with classroom teachers. For one hour, the participants interact in instructional level groups and hear first-hand examples of effective strategies for working collaboratively with colleagues. We are delighted that classroom teachers will be joining us to provide first-person testimonials of their collaborative work with their school librarian. Participants will complete a puzzle that shows how inquiry learning and reading comprehension strategies align the work of school librarians as defined by AASL’s Standards for the 21st-Century Learner with the Common Core College and Career Readiness Standards. In addition, we will devote a half-hour slot to modeling and practicing close reading to help readers comprehend complex text. I would also encourage you to visit the exhibit hall during the conference. 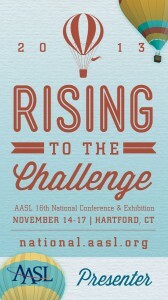 In addition to vendors’ displays and presentations, you will find demonstrations in the AASL Booth related to various AASL resources. I would be remiss if I failed to mention our book Best of KQ: Instructional Partnerships: A Pathway to Leadership. Coeditor Susan Ballard and I will be signing in the AASL Booth #1131 on Saturday, November 16th from 9:30 to 10:00 a.m.
And please stop by the Eerdmans Books for Young Readers Booth #328 where I will be signing my new picture book Ready and Waiting for You. The 16th National American Association of School Librarians Conference is coming to Hartford, Connecticut from November 14th – 17th. 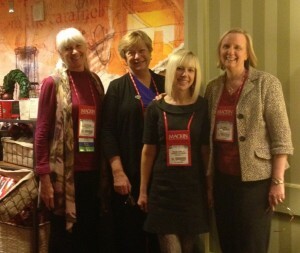 This biennial conference offers a gold mine of professional development opportunities for those lucky enough to attend. For school librarians serving in states where the school librarian division is only a part of their state conference, this conference devoted solely to the work and needs of school librarians may be particularly valuable. “Rising to the Challenge” is an apt theme for this conference. Across the nation, school librarians are being asked to step up in many different ways. Demonstrating and documenting our contributions to student learning outcomes is a huge part of our challenge in 2013. In states that have adopted the Common Core State Standards or are rolling out other curriculum initiatives, school librarians are working together to determine their place in helping students and teachers succeed. The one book, one conference title is 18 Minutes: Find Your Focus, Master Distraction, and Get the Right Things Done by Peter Bregman. Mr. Bregman will speak at the closing session on Saturday. You can access information about the preconference workshops (Registration is still open), concurrent sessions, and special events on the AASL conference Web site. Whether or not you are able to attend in person, you can join the conference Ning. You can also choose to follow the conference via social media. The Twitter hashtag is #aasl13. There are so many ways to connect, learn, and network. “See” you there!